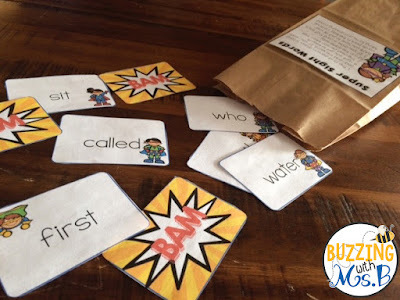 Buzzing with Ms. B: How to plan an awesome family event *Freebie! How do I know it's back to school time? All of my plants that I grew so lovingly in the spring, watered all through the summer, fertilized and pruned are either pathetic, desperate for water, or downright crunchy. Because by the time I stumble home, sore and crabby, carrying my bag and at least one box full random items for cutting, dyeing, or filling out, I am completely uninterested in watering my plants. That's why I buy succulents, folks. The hardier the better. So we're back to school. I've been back for three weeks, being trained and training others, and last week was our first official week back with the kids. And I am dead tired. It's a Stranger Things marathon kind of weekend, people. Recently, I was talking to some of my friends who are new to coaching, and she asked me, "What's the FIRST thing you do when you plan a family night?" 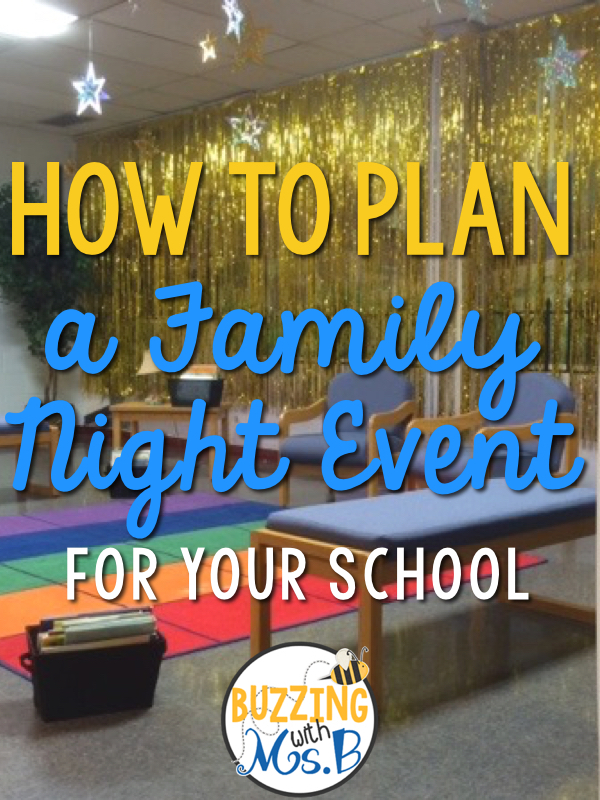 It took me a little thinking, but I think I've narrowed down my family night planning to nine easy steps! I know that sounds ridiculous, but I wanted everything to be very clear. 1. Decide on your purpose. To engage families in fun activities at school to help them enjoy the time they spend there. 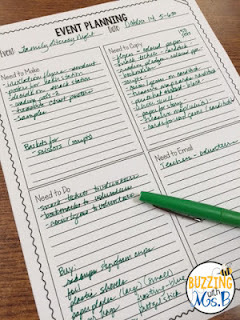 To teach families easy things they can do to help their kids at home. 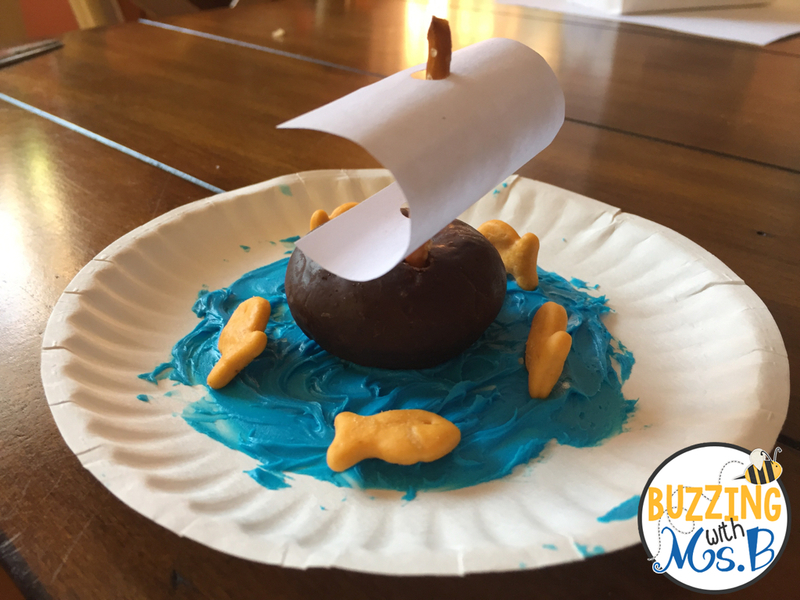 To help families create activities they can do at home. 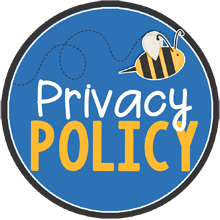 To inform families about education on your campus or in your state. 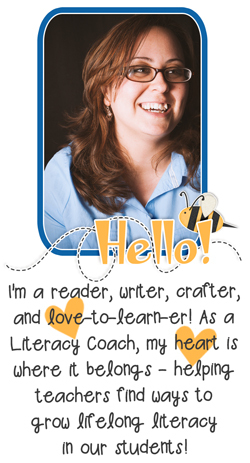 To help families learn about and think about their future plans for their child's education. The purpose you have will determine the kinds of activities families participate in! Parents love a good theme! 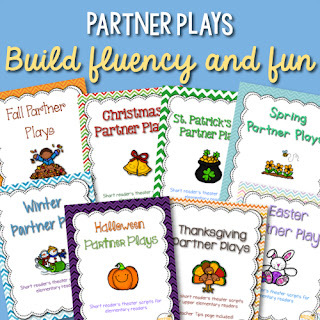 And it really helps when you're thinking of fun ways to approach the activities. How will you incentivize attendance? At our school, every child who attends a family night event gets a "Free Dress Pass" when they leave. This means they can wear free dress rather than the uniform the next day. You could also do a "No Homework Pass." Food is also a great incentive. For our Family Dream Night at the end of the year, every teacher brings a bag of hot dog buns and a package of hot dogs. Our admin pitches in to get the rest. Our coaches grill everything up and we give out one to each person that night! Huge turnout every year! 4. Think of the experiences you want kids to have with their parents. I usually approach these as stations. Stations are an easy way to make sure that there's something for everyone to do and people don't spend too much time waiting for an activity. Make a snack while following a procedural text - our people show up when we feed them! And obviously, read, read, read!! I usually end up with about 6-7 stations. Each station needs about 2-4 people to man it. Obviously, crafts and snacks take a few more people than something simple like reading. I send out an email to teachers about three-four weeks before a family event asking who will attend. On our campus, teachers rotate, taking turns coming to our Family Math Night and Family Literacy Night. Everyone comes to Dream Board Night at the end of the year. Teachers respond to my email and I start identifying who will work at each station. After I have everything figured out, I send everyone an email explaining where they will go that evening and what time they should arrive. What will each of these things look like? Look to your theme for inspiration! Spend some time googling "pirate word list" or "superhero word list". 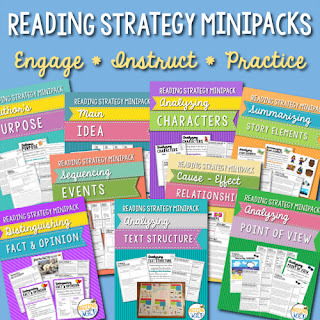 Hunt on Pinterest for ideas related to your theme that you could integrate into a station. Create materials for each station. 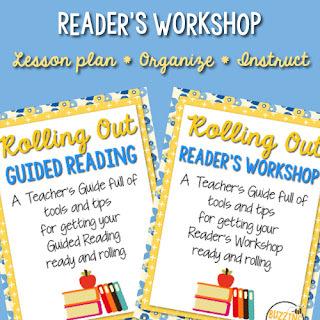 These include the directions, which I print out and make into posters, and any handouts or graphic organizers people will need to participate in the activities. I map out the areas I will be using for Family Night. 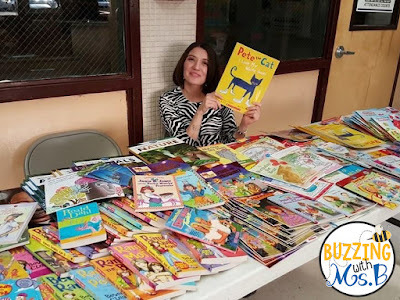 We use the front entry in the school for bag and book distribution, the science lab for the snack station, the gym for several stations, and the cafeteria for several more. Noisy activities should be separated from quiet activities; messy activities need an easy-to-clean space. I provide the map to the custodians who help me by setting up the tables, chairs, etc. 7. Make a list of materials you need. Estimate the number of people and then examine your stations. How many of each material will you need for that many people? Make a list with quantities. If you need to buy it, buy it! If you need to make it, make it! Sort all of your materials. To organize your snacks, it helps to provide each student with a little bag of everything they'll need. I also make a sample of each station activity to help teachers, kids, and parents know what they're expected to do there. 8. Organize everything on a cart. This is a lifesaver. Instead of having boxes and piles everywhere, I set everything up on a multi-level cart. 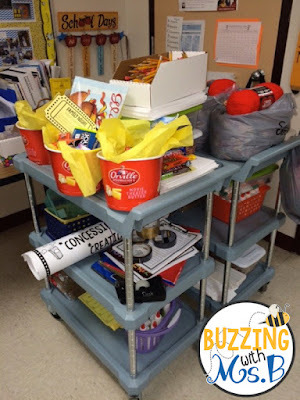 For example, everything I need for my first station (sentence strips, crayons, and pencils) go on the top level of the cart with a sticky note that says "Station One". A week before the event, I send an invitation out to each student on colored paper. We announce it every day over the announcements, and we put it on the marquee as well. 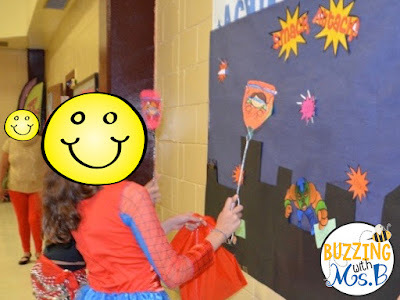 You could also send out a half-sheet the day before the event to remind parents. Want to learn more? 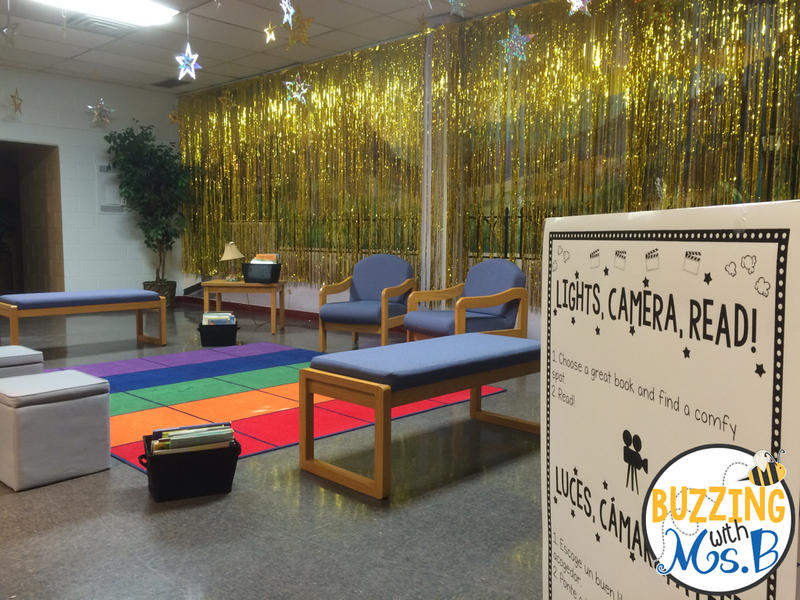 Check out my How to Plan an Awesome Family Night video! You could also skip many of these steps and purchase one of my pre-made (and kid-tested!) 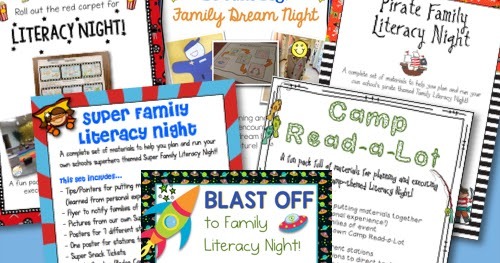 Family Nights from TPT! 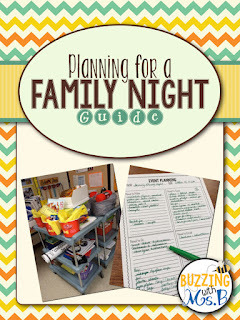 For an easy-to-print version plus a freebie page from my Coaching Megapack, visit TPT and download the freebie guide to planning a family night! 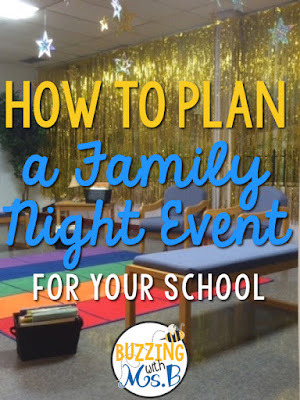 Read about my other family night events on the blog! Perfect timing! We are in the process of planning our 2nd Annual Literacy Night. 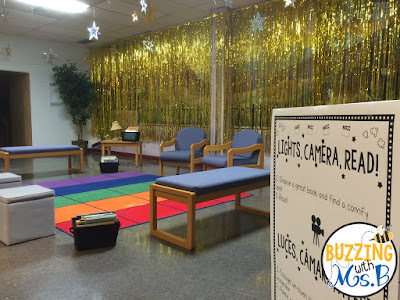 We used your Roll Out the Red Carpet for Readers theme last year and it was a huge hit!